Does your child wear glasses? If so, has he or she ever complained of headaches that improved or were eliminated with a change of prescription glasses or wearing a pair of glasses for the first time? That would be very rare, at least according to a “study” presented at the meeting of the American Academy of Ophthalmology. This study from the Albany Medical Center in New York believes that vision problems or eye are rarely the cause of recurrent headaches in children, although headaches usually strike while the child is doing schoolwork or other visual tasks. If this sounds suspicious to you, it should. The biggest problem: the study was retrospective. Scientists agree that only prospective studies (see below) constitute real scientific evidence. This press release claims clear evidence that vision or eye problems are rarely the cause of headaches, and that there is no correlation between the need for glasses and headaches. And what kind of study is it? A retrospective study! Prospective studies usually have fewer potential sources of bias and confounding than retrospective studies. For this reason, retrospective investigations are often criticised. There seems fishy, does it not? Of course! This is another effort by the association of ophthalmologists in the United States to convince the public that glasses are prescribed unnecessarily. The press release highlights the hope that this study will help to reassure parents that most cases of headaches in children are not associated with vision or eye problems, and that most headaches will disappear with time, even if the headaches usually strike while the child is doing schoolwork or other visual tasks. My eye! A statement of this nature has broad implications, and it intended (?) to assure parents that headaches are not likely to be causes by use of vision. The authors prefer to direct the public to a pediatrician that will decide if a visual examination is necessary rather than consult an optometrist! The burden of proof for such claims is on the investigators, because it runs counter to gold standard published research. 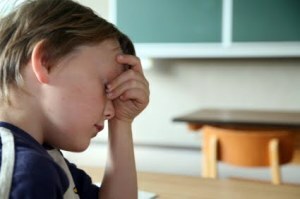 Acknowledged by all parties to be one of the best studies ever published jointly by Optometry and Ophthalmology regarding children’s visual symptoms, the CITT noted that 32% of all children with convergence insufficiency (CI) reported headaches occurring fairly often or always while reading or doing close work. Given that the prevalence of CI occurs to a greater degree in the population studied than strabismus, amblyopia, and high ametropia combined, and that no provision is made in vision screenings by pediatricians or school nurses to detect the condition, this study stands to confuse rather than clarify the role of vision conditions regarding headaches in children. The authors report that 13.9% (22 children) of their population experienced headaches associated with visual tasks. This means that 86.1% (136 children of a total of 158) of their population had a headache type for which visual input was not a factor, and therefore a severely skewed population in which one would not expect to find that glasses had more than a chance influence.